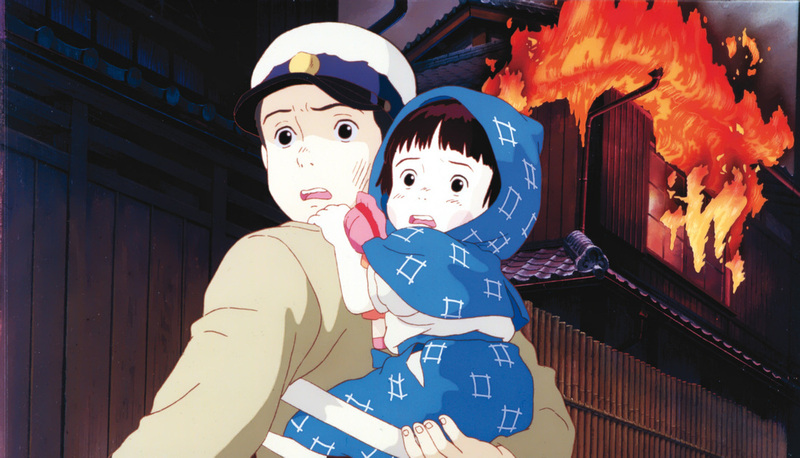 This article is a review of GRAVE OF THE FIREFLIES. “September 21st 1945, that was the night I died,” Seita. An opening line bold for any film, let alone an animated feature. Seita dies homeless in the underground with disdain from passersby. The Americans are coming soon, said one. The film then jumps back in time to during the war. 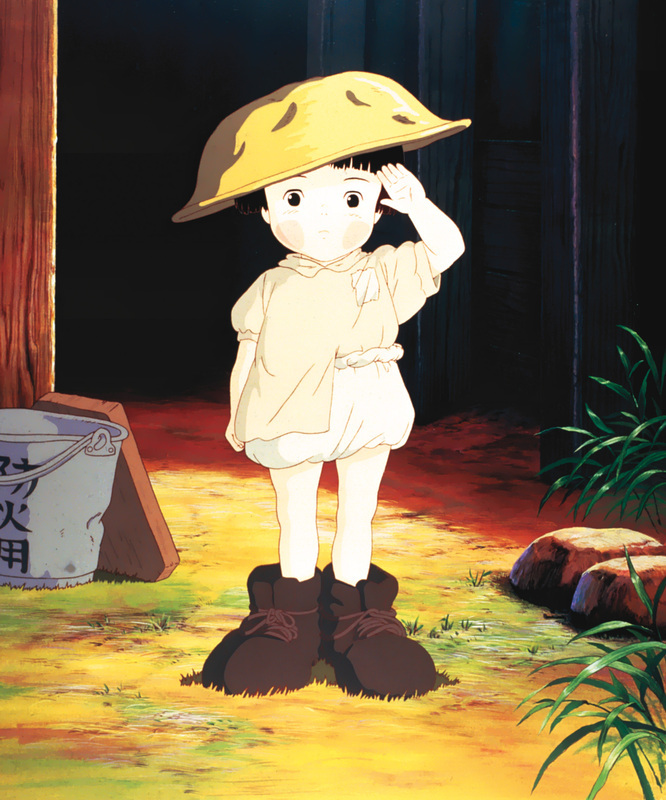 GRAVE OF THE FIREFLIES was released in Japan in 1988 and is from writer-director Isao Takahata (MY NEIGHBOURS THE YAMADAS, POM POKO, ONLY YESTERDAY), and co-founder of Studio Ghibli with Hayao Miyazaki. The original novel is by Akiyuki Nosaka. This is one of the most powerful, stirring and moving portrayals of war I have ever seen. The last word Seita mutters is “Setsuko”. 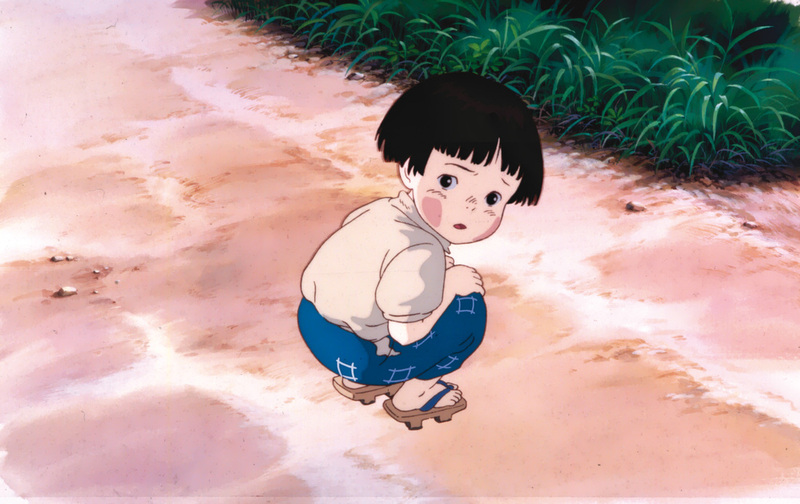 Setsuko is Seita’s four year old sister. We see the siblings with their mother as an air-raid begins as fire bombs are about to be dropped from American planes. Teenage Seita tells his mother to go on to the air-raid shelter while he packs in the ground for protection some essential supplies, and then carries Setsuko on his back as they run for safety. The fire bombs drop before the brother and sister can reach the shelter but they luckily survive. The devastation to the Japanese wooden houses is immense. There is a striking image of a bird’s eye view of the shell-shocked city. There is black rain from all the bombing. For an American description of the impact, see Errol Morris’ Oscar winning documentary, THE FOG OF WAR. When the air-raid is over they search for their mother, who has heart trouble. She tragically has been badly injured during the bombing and dies. Seita tries to keep the news from Setsuko as long as possible. Their father is fighting in the navy. Here is the perspective of war from the experiences of children. They should have been protected by relatives at least, if not by the state; but they are heart-breakingly let down. Their aunt, who initially takes them in, turns out to not to be a kind person, she is jealous and malicious – seemingly taking out her issues with the country’s foreign policy on her nephew and niece. They eventually feel like they have no choice but to leave and find a home elsewhere. Seita does not know how to contact their other extended family. They make a home in a shelter near a lake and try not to starve. Seita’s job at the factory has gone, and cannot go to school, as they have been destroyed. Sata attempts to look after his sibling, body, mind and soul. 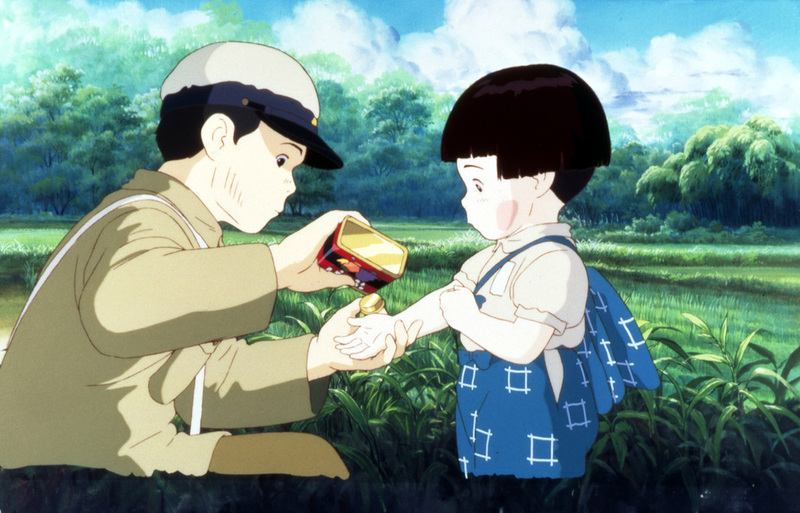 GRAVE OF THE FIREFLIES is a masterful take on the horrors of war, laden with the deep sorrow of no-one to look after these children. The film deals with similar elements to J.G. Ballard’s EMPIRE OF THE SUN, which was turned into a Steven Spielberg film starring a young Christian Bale. This, however, is far more effecting, due to the level of tragedy. It is unclear whether the film is a commentary on society in general, regardless of nationality, or only society during wartime. Would the children be helped if at peacetime? 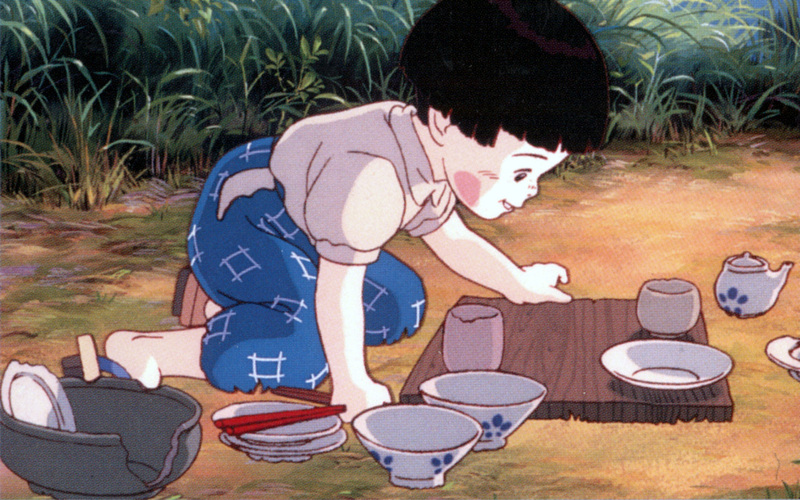 The animation is elevated during the depiction of the fireflies and character representations. The detail of the buildings and backgrounds are not up there with Hayao Miyazaki’s best, but one wonders whether the film could have his beautiful designs with such subject matter? 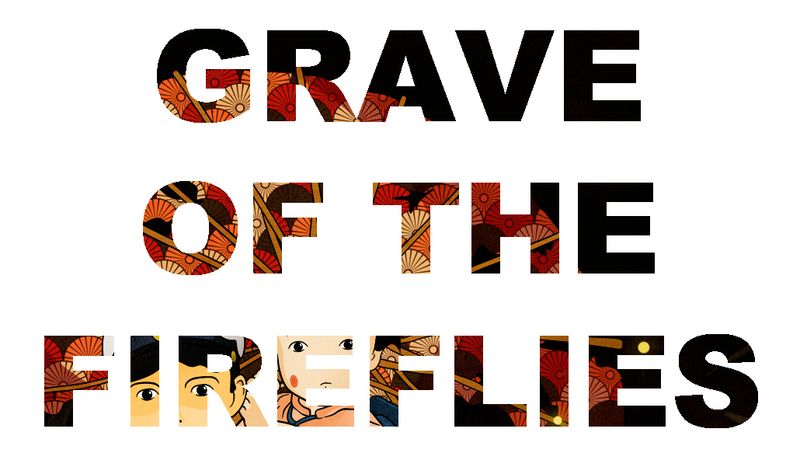 GRAVE OF THE FIREFLIES should be seen by everyone.